With the new improbable wave of popularity for sumô — Japan's colorful, ritual-soaked national sport — interest in classic ukiyo-e that depict the lumbering but limber lords of rings past is once again growing. Such prints have generally been collected only for memento value (despite Lawrence Bickford's efforts to elevate their artistic ranking in his book Sumo and the Woodblock Print Masters ), but in fact they can be charming, inventive, and even, well, possessed of a certain weight. The sumô prints shown here are unusual in that they were all published in Osaka. In the 19th century, big-time sumô was largely centered in the city of Edo, but Osaka enjoyed a kind of minor league status and was occasionally visited by top wrestlers. Bouts of fan enthusiasm must have ensued, but not too many; less than a dozen full-size second-city sumô prints are known. Fig 1 is an unsigned stencil print depicting Inazuma, the seventh yokozuna grand champion who held the title from 1828 (officially 1830) until 1839. His upraised hands — illustrating a moment during the ring entering ceremony — are a sure sign of a print from fairly early in the century; later on the convention in the land was to show the man's arms riveted down at his sides, of which there are hundreds of fairly boring examples from Edo. Note that Inazuma's name appears twice on the print, in huge letters on his ceremonial apron and again over the right shoulder. Additionally worth noting is the format of the print — the hosoban size, barely more than half the standard width — and the colors, which are also far from standard. In stencil prints, only the black outline is printed off a woodblock; the rest of the pigments are applied with a stiff brush that is scratched over a cut-out stencil. This technique (a give-away are the thin white lines caused by the reinforcing ribs of the cut-out) was a "primitive" precursor to multi-colored woodblocks — clearly a throwback, but one that continued to be used in Osaka, for reasons poorly understood, until as late as the 1840s. 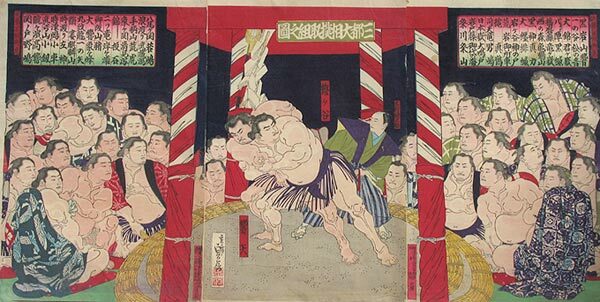 Fig 2 is a triptych by Sadanobu II, dated 1878, showing the future 15th yokozuna Umegatani grappling with an opponent under the gaze of all the upper-ranking rikishi. This was a set piece for print artists, as were perspective views showing the whole crowded arena, scenes at groaning dinner tables, and, as in Fig 3, images of wrestlers stepping out on the town. 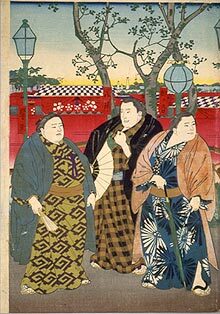 In this case, the three dapper men near Osaka's Tenjin Shrine comprise the center portion of another Sadanobu II triptych that features, as well, a coterie of strolling kabuki actors and courtesans. Such a composition encapsulates the three interlocked worlds of old ukiyo society, even as Westernization (note the newly-installed gas lamps and the umbrella) was pushing that society out of the ring forever. This article originally appeared in Daruma, no. 17, Summer 1997. Copyrighted © text and pictures reprinted with permission.